Mayor Don Ness; in the background Randal Zimmermann, chair of SBT graduate programs, chats with Laura Ness. 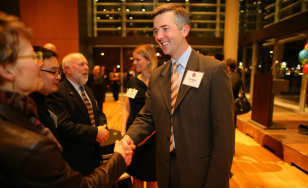 Duluth Mayor Don Ness has been named Person of the Year for 2013 by Twin Cities Business magazine. The College was a sponsor of the Jan. 9 ceremony in Minneapolis. Ness, 40, is a master of arts in management student at the College.